We at SLO Sail and Canvas believe that our skills as craftsman are evident in every product that we make. We take great care in making each product and the facilities that we have enable us to do high quality work efficiently. We have over 4500 square feet of space with six in-floor sewing machines! This allows for many projects to be set up efficiently. 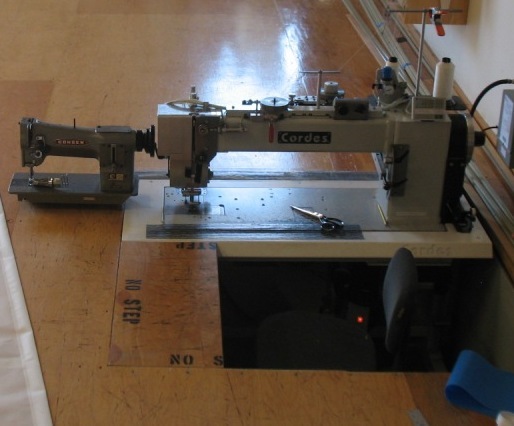 Our loft is equipped with a number of industrial sewing machines to ensure we are using the right machine for the job. We just installed our XL Cordes zig-zag machine for doing large sails. The Cordes dwarfs a normal industrial sewing machine! SLO Sail and Canvas is now the proud owner of two Juki bar tackers, one of which is an AMS machine. Both machines feature digital control panels allowing us to design and build custom bar tack patterns. Our Juki 1900A-HS has a maximum field size of 30mm by 40mm and our Juki AMS-210EN-1306 has a maximum field size of 130mm by 60mm. We have used these machines to build cargo nets, load straps and much more. Below the images of each machine are photos showing the tack patterns we use on cargo nets. Please contact us if you have a need for this type of work. We use our new in-house Autometrix Plotter-Cutter to cut out an ever increasing number of our boat covers. This video is our Autometrix Advantage system cutting out an Optimist sailboat top cover. We design the boat cover using AutoCad and then import the design into the plotter driver program called Patternsmith which gives the cutter the coordinates to cut out. This is how we cut out our boat covers so they are perfect every time. After we have a perfect pattern for a boat we digitize it into Patternsmith, our plotter driver software. This image of a Sunfish cover digital pattern will be used to control our Autometrix plotter-cutter and give us a perfectly cut boat cover. Our employees are highly trained in sewing, and use techniques that produce very durable products. We use multiple rows of stitching to prevent any premature failure of our product. All of our products are heavily reinforced in areas that receive a lot of wear.